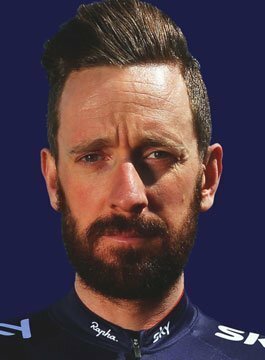 Sir Bradley Wiggins CBE is a former professional road and track cyclist and Britain’s most decorated Olympian. Wiggins racked up six world titles and three Olympic gold medals in track racing before focusing on road racing. In 2009 Sir Bradley earned a podium place at Tour de France demonstrating his Grand Tour potential. He earned a spell in the Maglia Rosa at the 2010 Giro d’Italia before winning his first UCI World Tour race at the 2011 Criterium du Dauphine. A second Grand Tour podium followed at the 2011 Vuelta a Espana before Wiggins embarked on a near-perfect run in 2012 which saw him win four races on his way to winning the 2012 Tour de France yellow jersey. His 2012 Olympics win cemented his position not just within his sport, but as a household name in Britain. His easy charm in front of the press was legendary and he won the BBC Sports Personality of the Year. 2013 brought further success, including the Tour of Britain title, and in 2014 Wiggins won the World Time Trial Championships. In 2015, Wiggins signed a contract extension with Team Sky, before transferring to his newly found Team WIGGINS in order to prepare alongside other members of the British track endurance squad for the team pursuit at the 2016 Rio Olympics. On 7th June 2015, Wiggins broke the hour record, riding 54.536km (33.881 mi). The Summer of 2016 saw Bradley Wiggins win his 5th gold medal at the Rio Olympics in the team pursuit and his eighth Olympic medal, making him Britain’s most decorated Olympian ever. Off the track, Bradley has made a number of radio and TV appearances including a program for BBC Radio 6 in which he discussed his love of music and mod culture alongside Paul Weller. Wiggins has written a number of books about his career including In Pursuit of Glory, My Time and My Hour. Commercially, Bradley Wiggins has previously collaborated with Fred Perry clothing label to develop an authentic, non-technical range of cycle wear. Halfords have a series of “Wiggins bikes”, designed to encourage children to get out cycling. Most recently, Wiggins announced his long-term strategic partnership with Skoda. Sir Bradley lives with his wife Catherine and two children Ben and Isabella in Eccleston, Lancashire.